Andre Lamont Johnson, better known by his nickname Optimus Prime, was born on the 11th July 1981, in Miami, Florida, USA, and is probably best known for being a professional American Football player, who plays in the position of wide receiver, but is currently a free agent. Formerly, he played in the National Football League (NFL) for the Houston Texans (2003-2014), and for the Indianapolis Colts in 2015. His professional career has been active since 2003. So, have you ever wondered how rich Andre Johnson is, as of mid- 2016? It has been estimated by authoritative sources that the total size of Andre’s net worth is over $20 million; his annual income is over $10 million, most of this is the result of his successful involvement in the sports industry as a professional NFL player. 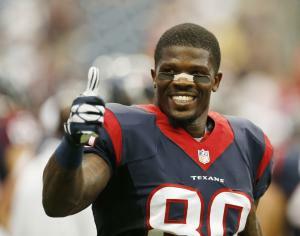 Andre Johnson was raised in Miami, where he studied at Miami Senior High School, from which he matriculated in 1999. While at high school he started his football career, and excelled in it, as he finished his career with 32 passes received for 931 yards, and he was named a Parade All-American. Later, he continued to play college football when he became a student at University of Miami, playing for the Hurricanes’ football team. Thanks to his skills, he was ranked No. 5 on the University’s all-time career list with 1,831 receiving yards. Andre’s professional career began in 2003, when he was selected as the third overall pick by the Houston Texans in the 2003 NFL Draft. He played for the Texans until 2014, during which time his net worth increased by a large margin. Before the training camp began, he signed his first professional contract, worth $39 million over six years. In his rookie season, Andre had 66 receptions for 976 yards and 4 touchdowns. The following year, his numbers increased, recording 79 receptions, 1,142 receiving yards and 6 touchdowns. In the following years, Andre continued to dominate the football field, becoming one of the best players of the franchise. On account of that he holds several records, including the ones for receptions, receiving yards and receiving touchdowns. In 2007 he signed a contract extension worth $60 million, which was supposed to last seven years, increasing further the overall size of his net worth. After his contract expired, Andre became a free agent, and soon signed a contract with the Indianapolis Colts, worth $21 million over three years, however, after only a year; he was waived by the club. So currently he is without a contract. Anyway, during his career Andre has received several prestigious awards, and recognitions, including seven times selection for the Pro-Bowl, in 2004, 2006, 2008, 2009, 2010, 2012 and 2013. He was twice Receiving Yards leader, in 2008 and 2009, and three times AFC receiving yards leader, in 2008, 2009, and 2012. Furthermore, he was named five times as the Houston Texans Team MVP, in 2006, 2008, 2009, 2010, and 2013, among others achievements. Speaking about his personal life, Andre Johnson is the parent of a daughter born in 2010; the name of her mother is unknown in the media. He is also known for establishing the Andre Johnson Foundation, which helps children raised by a single parent. Beside that, he also works with the Houston Police Department’s Blue Santa program.